Homeowners can help combat the destructive citrus disease, huanglongbing (HLB) or citrus greening with tiny wasps. 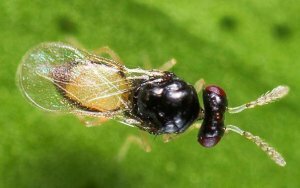 The Florida Department of Agriculture and Consumer Services (FDACS), Division of Plant Industry are providing residents with Tamarixia radiata; a wasp known to control Asian citrus psyllid, the culprit for citrus greening in Florida. FDACS have been providing more than 1 million tamarixia annually to commercial growers, but this is the first year the wasp vials have been made to residents. State scientists home that the wasps will help fight citrus greening in smaller urban areas. To order the wasps, homeowners should complete an online application.